Zoombezi Bay, which used to be known as Wyandot Lake, is a large outdoor water park that is affiliated with the Columbus Zoo. It features a number of slides and rides. Among Zoombezi Bay's more thrilling attractions are Cyclone, a funnel ride, that sends passengers in four-person cloverleaf rafts down a chute and into a sideways-facing funnel. The Dolphin Dash is a multi-rider, mat-racing slide. The Tahitian Twister family raft ride is especially thrilling since it is enclosed and experienced in total darkness. Sea Snakes is a water park bowl ride that deposits passengers into a bowl where they swish around a few times before being deposited into a splash pool. Big Boa Falls is a fairly unique ride that includes an enclosed tunnel and an airtime hill. Other body and tube slides include Sea Tubes, Sea Splash, and Python Plunge, a water slide that uses water jets to shoot riders uphill. In 2018, Zoombezi Bay added Otter Banks, a new area at the park. Its featured attraction is Sandpiper Splash, a pair of drop slides that offer freefall sensations. There is also Sea Challenge, a water-based obstacle course, and Sand Dollar Shores, an activity pool with water basketball that doubles as a zero-entry pool. Milder attractions at the water park include Croctail Creek, a lazy river reserved for adult guests, and the Roaring Rapids action river, which ratchets up the thrills a bit for guests of all ages. Wild Tides is the park's wave pool. Younger children will want to check out Baboon Lagoon, an interactive water play structure that includes smaller slides, soakers, and a big tipping bucket. Tiny Tides caters to tots and offers animal play structures in a water playground. Other features at the park include private cabanas for rent and "dive-in" movies, which presents feature-length films on select Friday evenings at the park. Discounts for children 3 to 9 and seniors 60 and older. Ages 2 and under are free. The park offers discounted online prices when purchased in advance on its Web site. Prices include admission to the water park and Columbus Zoo. 2-day tickets are available. season passes are available. Zoombezi Bay offers birthday party packages that include a cabana rental. The nearby zoo can accommodate group events and group discounts are available for the water park. Note that guests are not permitted to bring food into the water park. Zoombezi Bay's food stands include Boogie Beach BBQ-n-Brew, which offers BBQ chicken and pork sandwiches and Big Island Grill and Surfside Grill, which serve burgers and other meals. Powell, Ohio. The actual address is 4850 West Powell Rd in Powell. East of Columbus: I-70W to 270N to Sawmill Road (Exit 20). Go north (or right) on Sawmill Road, which becomes Sawmill Parkway, and turn left onto Powell Road/SR 750. The park is approximately 1 mile ahead. From west of Columbus: Take I-70E to 270N. Follow directions above. From south of Columbus: Take I-71N to 270W to Sawmill Road (Exit 20). Go north (or left) on Sawmill Road. Follow directions above. From north of Columbus: Take I-71S to 270W to Sawmill Road (Exit 20). Follow directions above. 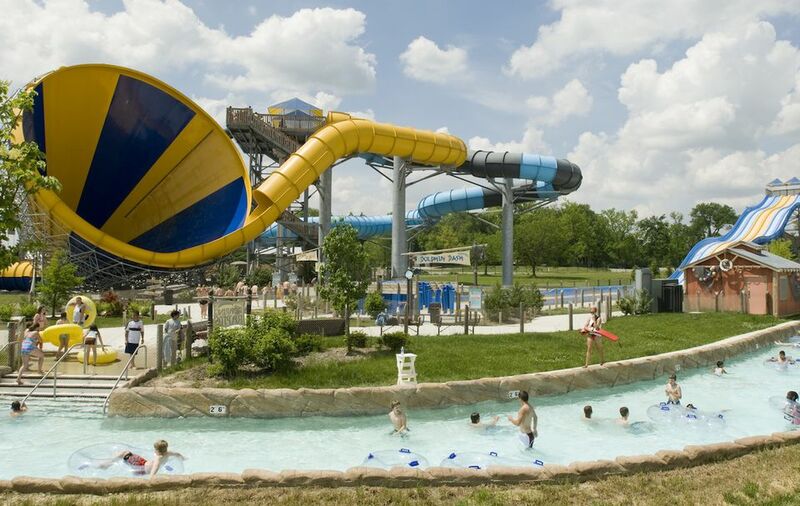 Where Are the Best Water Parks in Metro Columbus, Ohio? This Is Among the Best Indoor Water Parks in the U.S.